Three days after they were apprehended by the Royal Bahamas Defence Force, 7 Dominican fishermen were charged before the courts on December 14, 2018 in New Providence for poaching in Bahamian waters. 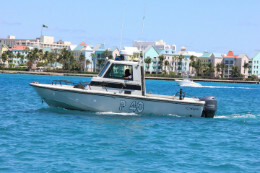 The Royal Bahamas Defence Force (RBDF) apprehended 7 Dominican fishermen aboard two small go-fast type boats around noon on Tuesday 11 November 2018 in the area of Little Inagua. Consumers affected by a regulatory breach by the Bahamas Telecommunications Company (BTC) can expect to receive a $100 credit applied to their cellular mobile account on 12 December 2018. Approximately 40 participants from the Royal Bahamas Defence Force took part and dominated The Bahamas Law Enforcement Cooperative Credit Union Fun, Run and Walk competition this past weekend. The 3-mile race commenced at The Bahamas Law Enforcement Credit Union, Collins Avenue and took the competitors over Paradise Island and returned to the Credit Union. Members from the Defence and Police Forces participated in this event. 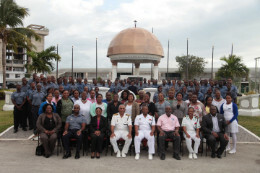 The Royal Bahamas Defence Force continues to raise awareness, as well as sensitize its personnel to illicit activities associated with Trafficking in Persons (TIPS) through training seminars coordinated by the RBDF Training Department at the Coral Harbour Base. 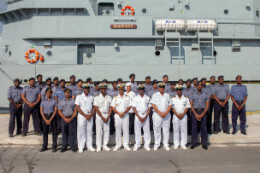 The recent report by a local tabloid stating that 8 of 11 Royal Bahamas Defence Force (RBDF) vessels were broken down are false and misleading. 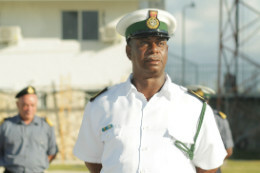 "Reporting of unverified information to the general public as fact is blatantly irresponsible," said Commodore Bethel. 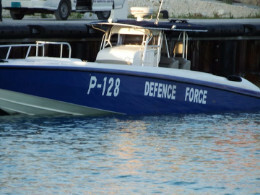 Royal Bahamas Defence Force rescued two Bahamian men around 1:30 a.m. this morning after their small craft capsized in ocean waters off Delaporte Point. Five outstanding athletes from The Bahamas sporting community paid a visit at the Royal Bahamas Defence Force’s Coral Harbour Base on November 16, 2018. Ongoing recovery efforts by Royal Bahamas Defence Force (RBDF), the Royal Bahamas Police Force and volunteer divers, and Bahamas Air Sea Rescue Association and a glass bottom boat continue to yield findings of debris eleven days after a light aircraft piloted by Captain Byron Ferguson crashed off the northwest coast of New Providence on Thursday 8th November, 2018. A joint rescue operation between the Royal Bahamas Defence Force and the United States Coast Guard resulted in the rescue of three Bahamians at sea on Sunday past. 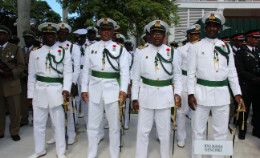 Commodore Tellis Bethel along with the Officers and Marines of the Royal Bahamas Defence Force joined the world in commemorating veterans of World Wars I and II on Remembrance Day. Instituted by King George V in 1919 in honour of these men and women, Remembrance Day is recognized by Great Britain, her overseas territories, allies and former colonies. Coral Harbour Base - The Royal Bahamas Defence Force Auxiliary vessel, HMBS Lawrence Major, departed Coral Harbour Base this afternoon to transport equipment and materials for the installation of a Meteorological Doppler radar in Long Island on behalf of The Bahamas Meteorological Department. The Royal Bahamas Defence Force is warning boaters to stay clear of an unidentified floating container unit found in waters off Farmer's Cay in the Exuma chain. 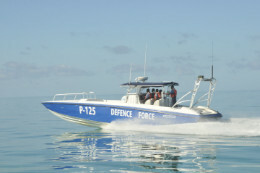 Search and Rescue teams from Nassau Airport Development Company, Bahamas Airport Authority, the Royal Bahamas Police Force Fire Services, the Royal Bahamas Defence Force Harbour Patrol Unit, the United States Coast Guard, and BASRA were dispatched to the north shore of New Providence in search of a light aircraft that crashed in waters off Nirvana Beach late night on Thursday 8 November 2018. 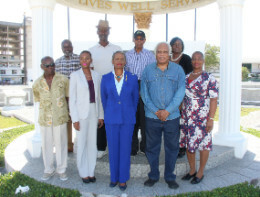 The British Legion-Bahamas Branch (BLBB) in collaboration with the Royal Bahamas Defence Force will pay homage to all Bahamian military veterans who served during World War 1 in a wreath laying ceremony at Rawson Square on Sunday November 4th at 2:30 p.m. 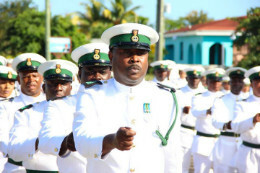 The Royal Bahamas Defence bid adieu to Chief Petty Officer (CPO) Lucitas Greene on October 29, who recently retired as an active serviceman, during a brief ceremony at HMBS Coral Harbour. After completing her refit at the Maaskant Shipyard in Stellendam, The Kingdom of The Netherlands, Her Majesty's Bahamian Ship (HMBS) BAHAMAS departed The Netherlands on October 4th arriving at Coral Harbour Base on 27th October, 2018 at 9:30 am.